Exchangeable apolipoproteins are soluble protein components of lipoproteins that mediate cholesterol transport and metabolism and play crucial roles in the pathogenesis of atherosclerosis and several other major human disorders, including amyloidosis. Our research is focused on the structural adaptability of apolipoproteins to heterogeneous lipoproteins and to plasma. This distinct adaptability is key to apolipoproteins functions and is attributed to re-folding and re-packing of the constituent amphipathic alpha-helices. Our earlier CD spectroscopic and calorimetric analyses suggest that lipid binding by apolipoproteins is mediated via the molten globule-like state in plasma. In our on-going NIH-funded research, we analyze the smallest human apolipoprotein C-1 (6 kD) by using mutagenesis and spectroscopic techniques to1) dissect the apolipoprotein folding pathway, from partially folded monomeric to fully folded lipid-bound state; 2) test whether the helix-turn-helix motif forms an autonomous folding and functional unit in apolipoproteins; 3) determine the role of hydrophobic clustering for the nucleation and stability of the helical structure. Helix-turn-helix autonomous folding unit in human apolipo-protein C-1 (right) inferred from the results of Proline scanning mutanegesis coupled with far-UV CD spectroscopy. Our recent spectroscopic and electron microscopic studies of protein folding / unfolding on apoC-1:lipid complexes that model nascent discoidal high-density lipoproteins (HDL), as well as on-going studies of mature spherical HDL isolated from human plasma, reveal a novel mechanism of lipoprotein stabilization that is based on kinetics rather than thermodynamics. Our current work is aimed at identifying in detail the molecular origins of the high kinetic barriers that determine lipoprotein stability. Folding and maturation of nascent proteins in the cell is dependent on the assistance of a diverse group of proteins termed molecular chaperones. These folding assistants bind to unfolded proteins, to stabilize them thus increasing their folding efficiency so that they attain their functional conformation in the overly-crowded environment occurring in the cell. Our laboratory is interested in elucidating the details of chaperone-assisted folding of apolipoprotein B (apoB) whose correct folding involves its assembly with lipids to form very low density lipoprotein (VLDL), the precursors of low density lipoproteins (LDL). LDL is a major risk factor for developing heart disease and stroke. Therefore, it is essential to characterize the underlying mechanisms that regulate the secretion of VLDL. We have identified a number of ER-resident molecular chaperones (e.g. 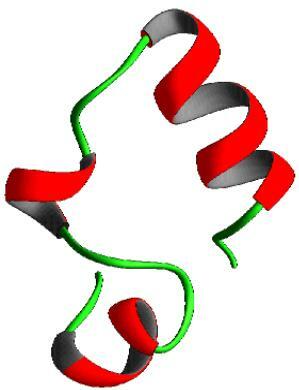 GRP94, ERp72, BiP, calreticulin and cyclophilin B) that interact with apoB during various stages of its maturation. We are characterizing these interactions and developing model systems to determine which of these chaperones are critical for the folding and secretion of apoB-VLDL and how do they perform their chaperone function. In addition, we are using a proteomic approach to identify potentially novel proteins that interact with apoB and may thus be critically involved in its folding. Some might be unique to apoB and may therefore serve as targets for modulating the secretion of VLDL. The McKnight laboratory is interested in the structure and function and folding of a variety of proteins. In particular we are interested in proteins of minimal length that are still able to form a fully native folded structure. For example, we use a combination of molecular biological, biophysical, and NMR methods to investigate the 35-residue subdomain from the headpiece domain of the F-actin-binding protein villin. The headpiece subdomain is one of the smallest folded proteins that is thermostable and monomeric, yet contains no disulfide bonds, and binds no metals. We hope to take advantage of the small size of the headpiece subdomain to bridge the gap between experimental and computational approaches to protein folding. Backbone ribbon representation of the 35-residue subdomain from villin headpiece is shown in the image to the right.